When someone is diagnosed with cancer, an entire family and community is affected. Create a treasured network of support for these courageous people by showing your commitment in finding a cure. 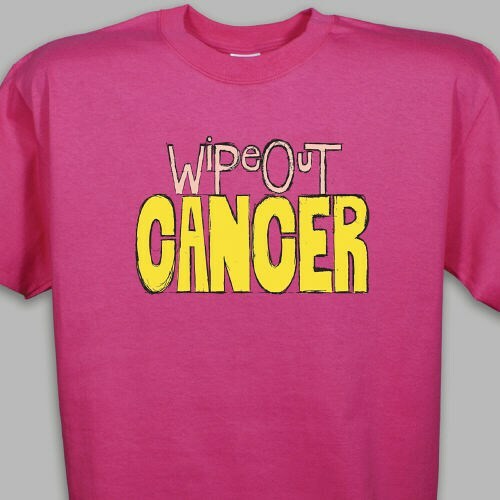 Wear our Wipe Out Cancer T-Shirt at your next awareness walk event to proudly show your a true supporter. Our Cancer Awareness T-shirt is a great way to support the fight for a cure. This Personalized Cancer Awareness shirt is available on our 100% cotton preshrunk colored t-shirt, machine washable in youth sizes XS-L and adult sizes S-3XL. I have not worn it yet. It needs to be washed before wear. It's a "great" quality t-shirt though. I love the colors! Showcase your commitment to spreading the word about the importance of research and treatment through our collection of Cancer Awareness Apparel & Walk Gear. For each item purchased, MyWalkGear.com will donate a portion of the proceeds to a charity of your choice. Be sure to also view our Wipe Out Cancer Sweatshirt and our Wipe Out Cancer Hat as well.